Feeding grain to your horses is an activity that not only costs a lot of money, but no matter how much grain you feed, healthy grass feed and later on hay from your own pasture is not only cost effective but also much healthier for your horses. 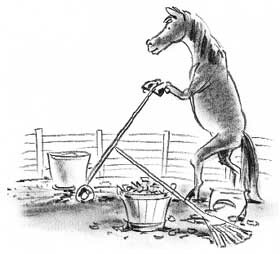 Of course, as a horse owner you know that you need to reseed and fertilize your pastures consistently to keep them producing grass throughout the year, but hot and dry weather during the fall season and cold, wet spring days may have prevented you from actually doing all the pasture chores that you knew should be done. If you find that your inactivity has harmed your pasture, you will need to bite the bullet and renovate your pasture. The best time to do so is fall. Renovating a pasture is little more than over-seeding or no-till seeding it. While your stand may be fescue, orchard grass, or bluegrass, you will want to actively establish clover into the pasture, not only to improve the quality and quantity of your forage, but also to counteract the dormancy stages of cool season grasses that leave the unsightly brown patches in many a pasture. Obviously, before you commit yourself to any number of pasture renovations steps that may or may not be needed, it is wise to first and foremost run a soil test which will indicate the nutrients and lime supplementation your pasture will actually need. While it is easy to assume that your pasture does not need testing again, especially if you tested it five years ago, it is important to note that the actually recommended testing intervals are much less, usually about two or three years. After testing and purchasing the proper fertilizer mix for your pasture, you will be rewarded with healthier crops that will be able to weather the occasionally unfavorable drought conditions or cold snaps. Additionally, if you horses have not already grazed the pasture low enough, you will need to mow it. Failure to remove the overhanging grasses will not permit your clover or grass seeds to sprout or receive adequate moisture, since the already established plants will soak it up via their root systems if they are permitted to stand tall. While you are renovating your pasture, you also need to address any weed problems you may have. While it is true that healthy grass and clover stands have the ability to choke out weeds, the weeds will be competition for the germinating seed. If you do use herbicides, remember that your horses will not be able to graze the pasture for a while! When you are purchasing the grass seed, stay away from the lawn mixes, but do go for a mix that promises high rates of germination. As you seed, it is recommended that you exceed the recommended quantity of seeds to not only ensure proper coverage but also maximum germination. Last but not least, drilling seed is usually the best way of seeding to ensure that the kernels have the best possible start. Read the next horse pasture article on Reducing Pasture Weeds.